Tara at Sticky Fingers has asked us to share a part of the world we live in: somewhere we may have been or where we currently live. I have shown you our fenland daffodils recently and many of my gallery photos have shown memorable places I’ve been lucky to visit such as Iceland, Rome, Berlin and Cyprus. So this time I have chosen somewhere a little off the beaten track. The scanned photo doesn’t show the colours particularly well but I think it fits the bill. 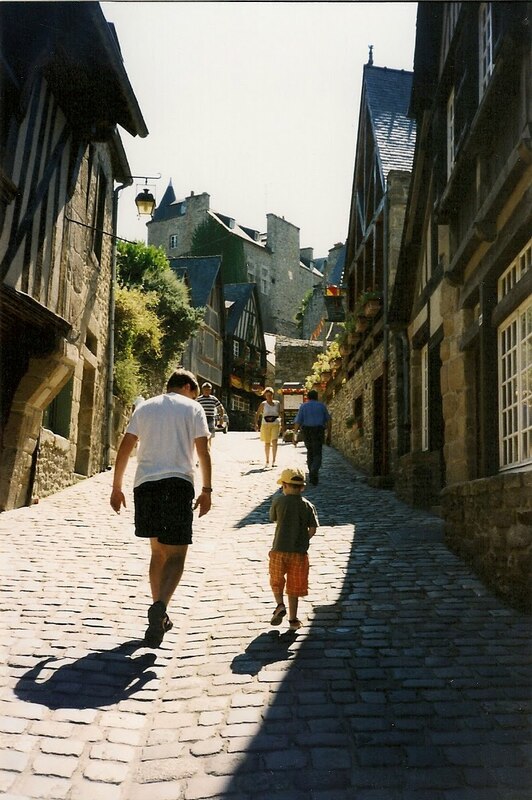 This is a little street in the town of Dinan, Northern Brittany, just South of St Malo. We visited when Rory was four. It was a hot day, he had to get carried a lot on his Dad’s shoulders, but when I saw this street, with the masses of flowers in window-boxes, it took my breath away. I asked my dad to paint a picture from the photo I provided and he re-created the scene beautifully. The picture is in our home now and always lifts my spirits. Sadly Dad can’t paint now: for the last 17 years he has suffered from Motor Neurone Disease and gradually his mobility has weakened. However his paintings are a source of real joy to the family and this one will always be very special to me. 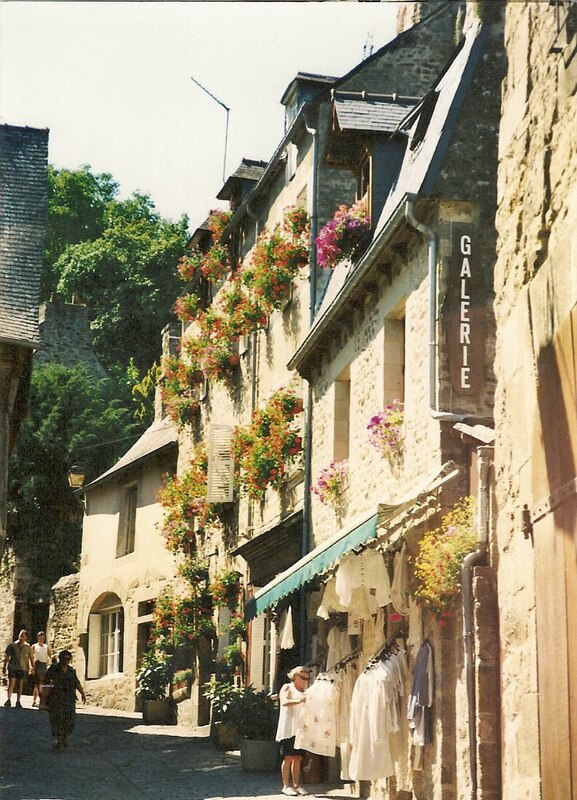 Dinan is such a beautiful place & is somewhere you can jsut lose yourself! Thank you for reminding me! What a beautiful painting your Dad created. He made me look at the photo again to hunt for the detail he has picked up. Stunning. So sorry he is so ill. And wow, Dinan is gorgeous. Must add it to my places to go list, along with Tara's secret beach. I love that the street seems to be named 'Galerie' as well. Very apt. I've never been but I am now totally sold on going. It looks wonderful and your dad's painting has really caught a wonderful sense of light and space. What a beautiful story and a beautiful painting. It captures your photograph perfectly. Beautiful painting – what talent! My family used to have a cottage in Brittany, close to Guingamp and Pontrieux and it's a gorgeous part of the world. What a beautiful painting – I too scrolled back up! What your dad has captured will last far longer than a photo. What a talent. How lovely that your dad painted the place for you – must make it twice special. 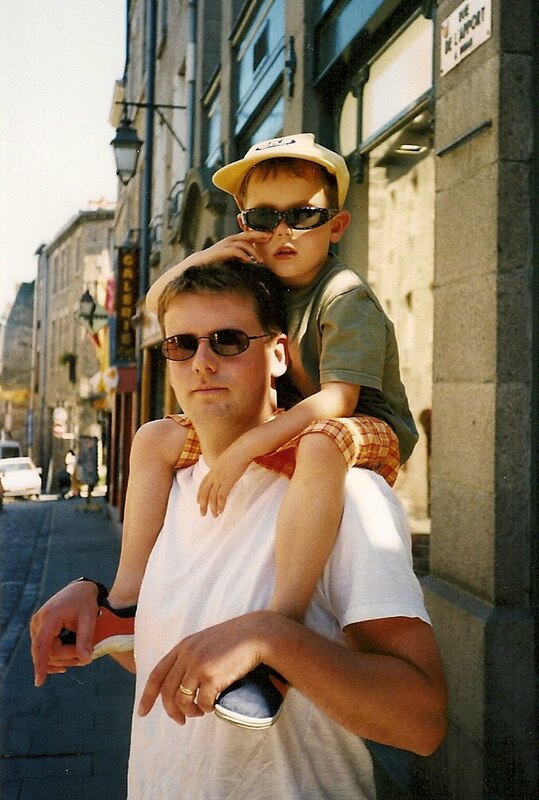 I haven't been to Britanny since a few months after my son was born nearly 8 years ago, but have lots of great memories (and a few bits of crockery) from there. That is a stunning picture and very special to you too. I think it would be hard work traipsing up those little streets in the hot sun. What a beautiful painting. Have any of you inherited his talent? What a fabulous place and a gorgeous painting. My dad is so pleased to see his painting on my blog and to read your comments. You have made his day. Lovely to hear of your memories of Brittany too. @Jo – It didn't occur to me to think of "Galerie" in the photo and link with this gallery! I think it was the sign for a little art gallery on the street. @notwaving – I had you down as the "funniest" too. We should have made more of an effort to get everyone we know to nominate us: if I worked in an office I could have bribed everyone to vote in their lunch-hour. Bugger! @Susie, it doesn't look as if anyone has inherited his talent, more's the pity. He used to be an architect and I think his skill at drawing the details in buildings is apparent. Your dad's painting is lovely, what a shame he can't paint anymore. I've not been to northern France for many years, we are considering a holiday though. Looks fab. Gorgeous views…and a talented dad. I agree with all the earlier comments that the painting is excellent. I also love the way he ignored the aerial on the building. Wish I had that skill (painting, not ignoring aerials). Just catching up on the other comments. Thank you so much. @Troy – I'd never noticed the aerial but Dad obviously did and cleverly took it out.